Yaaaay my first Daily Deviation!!! Thanks a lot to `jcroxas for suggesting it and `Hardrockangel for the feature! And special huge thanks to everyone for your comments and faves! Thank you!! 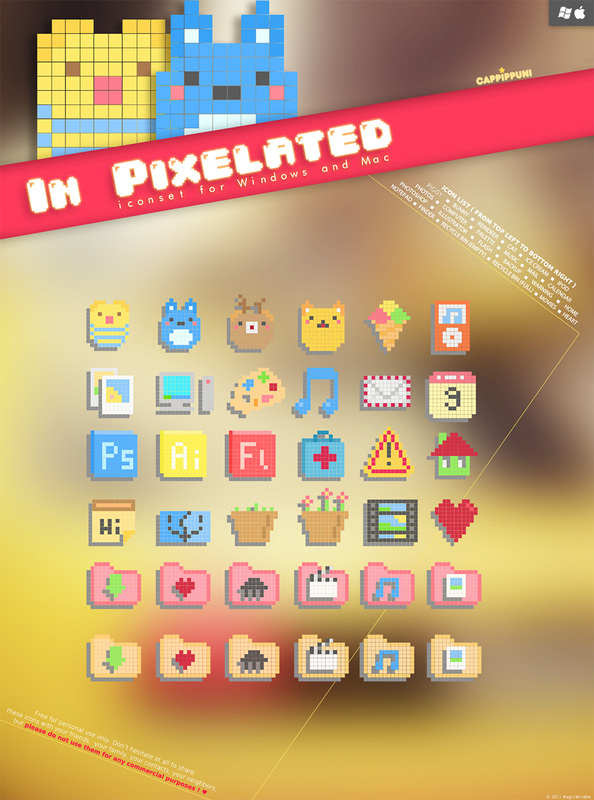 Finally done a retro-inspired icon set! Inspired by the 8bit graphics of the retro consoles of our childhood, namely the famous Nintendo's NES or Sega Megadrive, I wanted something... vintage and pixelized. 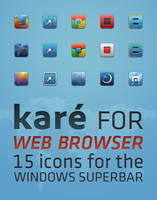 This icon set is compatible with Windows and also with OS X, both corresponding versions are included into the package. Choose the corresponding version depending of your operating system! © 2011 Cappippuni. Reproduction, distribution or modification on my works not allowed without my explicit consent. The suggester says: "This is such a cute, lovely and adorable icon set!" And I agree. I especially like how the pixels have been upscaled for a more chunky and retro effect! Thank you so much for visiting my gallery, unfortunately my DeviantArt page isn't maintained anymore and thus my account will be deleted from DeviantArt in late 2017! These are lovely. Thank you. This is such a cute, lovely and adorable icon set! <3 i Love this Thanks! Pretty please make a google chrome icon! i demand a pt. 2 with more animals! they're so perfectly adorable.. >_<!! I will try to find the files soon then probably uploading them. I love your icon sets! They're so beautiful! Would you mind if I use some of the icons in my pixelated beadwork? how do you use on mac? I have snow leopard. whats version 2.3.3? As you are using Snow Leopard, you will need to download iCondubber 2.3.3 at the following link: iCondubber 2 (click on the tiny link saying '2.3.3' at the right side of the mention saying 'Last release running on MacOS 10.6+:', at the bottom of the big download button for downloading a compatible version for your system). 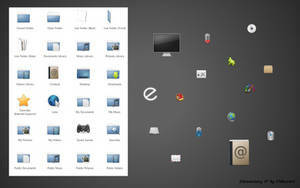 This software allow you to personalize your icons and even modifying the appearance of your Dock and few apps. Using Lion on my computer, I had some issues with this application too. I LOVE THESE! There's even a little finder icon! I'm totally going to give them a try. Thanks! Exactly, super old-school Finder icon!